Facebook’s CEO Mark Zuckerberg stunned many Chinese on Thursday, not with a new Facebook feature, but because he spoke and answered questions in Mandarin for almost half an hour. “Such an awesome person is learning Chinese, why is my own English so bad,” wrote one user on Chinese social networking site Sina Weibo. “I think the students at Tsinghua University are very good. Facebook has over 140 alumni from Tsinghua,” he said, adding. “Every year we come to China to hire from the best cities. 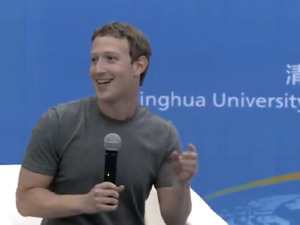 Last month, we hired 20 Chinese students.” Zuckerberg has visited China four times. “The best companies are created not just because an innovator wanted to create a company. It’s because the innovator wanted to change the world,” Zuckerberg said. “I think China has many of the world’s most innovative companies. Last night I ate with Xiaomi’s Lei Jun,” he said, referring to the CEO of Chinese smartphone maker Xiaomi, which has quickly become one of the country’s biggest handset makers. “Xiaomi is a very innovative company. They have developed many different products very fast,” Zuckerberg said. He also pointed to social networking products from Chinese Internet giant Tencent as another example, and said he was impressed with the e-commerce site Taobao from Alibaba Group. The social networking site has been blocked in China since 2009, as part of the country’s online censorship. Zuckerberg said Facebook has a growing business in the country by selling advertisements to Chinese companies. He pointed to three upcoming goals: connecting all of the world to the Internet, developing artificial intelligence, and creating more virtual reality products. Earlier this year, Facebook bought virtual reality headset maker Oculus VR for $2 billion. “Once everyone is using a mobile phone, I believe the next platform will be virtual reality. Oculus is the first product, but we hope to have many products,” he said. Following his talk, Internet users in China naturally asked when the Facebook website would enter the country. But Zuckerberg made no comment on it during the event. A Chinese official said he welcomed the site last year, but only if it followed the country’s Internet regulations. Not all of China’s Internet users were quite as impressed with Zuckerberg’s speech, with some commenting that he was hard to understand. But an Internet user named Lung Lei said most of what Zuckerberg said during his talk was spoken without any grammatical or usage mistakes, and he only need practice more on pronouncing his tones.